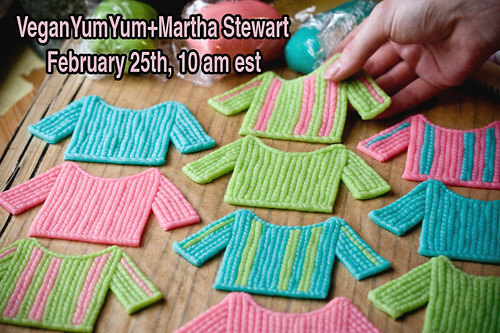 Martha Stewart has invited me to be a guest on her knitwear show on February 25th! I’ll be teaching how to make the decorations for the knit night cupcakes I made back in June. I’m really excited (and really nervous!) but I’m sure it will be a blast. Don’t forget to tune in to the Martha Stewart Show at 10 am on Monday, February 25th! I’ve got to get back to preparing for the show. I’m up to my eyebrows in marzipan! I leave for New York tomorrow, so there won’t be any blog updates until late this week. Wish me luck! No way! I’m bummed I’ll be at work. I’ll try to catch reruns! Rock on, Lolo. Wish you All The Best! Oh my gosh! Congrats Lolo!!! Have Fun!!! ill be in NYC this weekend too! wow! so exciting…ill be in NYC this weekend too! ill be on the lookout for yoU! Wow, that’s so cool! Congratulations!!! Can’t wait to see the show! That is so awesome! i’m so glad so many more people get to see these! good luck! That’s wonderful news! Congrats! I’ll have to record it so I can watch it when I get home from work. hurray! have fun and you will be great! I am so excited waiting for the day to arrive. Now if only we can get a vegan cook on Jolene Sugarbaker…..
My daughter and I were at the taping today–and we sat right next to your mom!!!! You did a terrific job, and your mom was so proud! We were so happy to see you! Good luck on all your endeavors! February 20, 2008 - 9:36 pm B.A.D. Yay for martha having more vegan guest! good luck good luck good luck good luck !!!!! Lauren you rock! Mom said you did an AWESOME job at the taping, just like I knew you would! I can’t wait for the show to air! Good luck. Those cupcakes were how I ended up reading your blog! Lolo, that is AMAZING! Congratulations! I’ll set my DVR so I can watch. I’m so very excited for you! Congratulations! That’s awesome! I love those cupcakes and used your tutorial to make them for the holidays. Everyone loved them. Good luck and, have a wonderful time! Oh. My. God. You’re going to be on Martha Stewart?!? That is SO cool! I’m definitely setting my TiVo up for that episode! Good luck, & if you start getting nervous, just remember that you have a ton of bloggers wishing you well! Have a wonderful time with Ms. Martha! February 21, 2008 - 7:51 pm Pingback: Taping at the Martha Stewart Show « It’s my world, join me, won’t you? I know you will make the Vegan world proud!!! This is great. I really want to see it but am having trouble figuring out which channel/station and time it is airing. Through the Martha Stewart website it says that the show is airing on WNBC channel 4 in New York at 1pm. I’m wondering which channel it is supposed to be on at 10am as the blog says. Thanks so much for your help here. Also, if anyone knows how to stream this channel from a website that would be great for all of us who don’t own or have access to TVs at that time. Thanks again! Bravo! I look forward to seeing you on T.V.! wow!! im really excited for you!!!! You’ll do great! I hope the experience was great – not too nerve wracking for you. February 23, 2008 - 10:31 pm kendra! Okay! Got my DVR ready! Martha, I would love to have the pattern for the sweater you wore on the show of Feburary 25/08. It was a fabulous show but I fell in love with the sweater you had on. Thanks your friend Carol from Canada. I just saw the show. You did a fantastic job! I love it when guests can stump Martha with their creative process. Great job having her think you knitted the marzipan to create the sweater! Congratulations! Oh I missed the airing! Is there any way you can put up a video on you tube for those who missed out?! March 6, 2008 - 12:32 pm Susie K.
Martha, I would love to have the pattern for the sweater you wore on the show of Feburary 25/08. I fell in love with the sweater you had on. I see there are other gals who liked the sweater as well. I especially liked it because it made you look very thin! And I need all the help I can get! April 3, 2008 - 10:06 am Susan Y.
I am really delighted and excited. Over here in Nigeria, when we get inspired from a proffessional, its an honor.When i saw it, it blew me away i simply had my mouth open to this great piece.